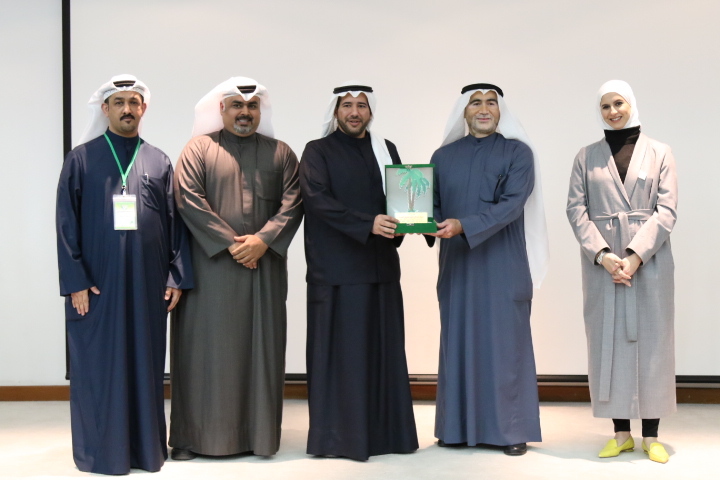 The closing ceremony of the proceedings of the Academy of Environmental Volunteerism was held in its initial version Under the auspices and in the presence of Al-sheikh Abdullah Ahmed Al-Hamoud Al-Sabah, president of the Governing Council and Director-General of the Public Authority for Environment, and in the presence of professor Anoud Al Subaihi, director of volunteerism administration, representative of Ministry of State for Youth and the Strategic Sponsor, and D. Adel Hassan Dasti, Chairman of the Society of Palms' Association Administration, the initiator and the General Supervision of the Academy. This was on the Environment Public Authority stage with the attendees of many invited persons and the first season of the academy's graduates, whereas Al-sheikh Abdullah Ahmed Al-Hamoud Al-Sabah asserted the importance and the role of the Academy in the development of the capacities and skills of the eco-volunteers. He also paid tribute to the role of the Society of Palms' Association in establishing the Academy and stating that the association would be ready to support and backstop various distinctive environmental projects.